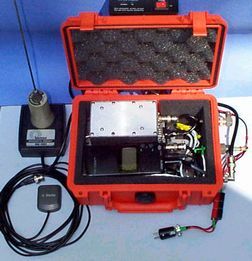 An APRS Tracker is a collection of equipment whose purpose is to beacon GPS derived position reports, via Amateur radio frequencies, to other APRS equipped users. 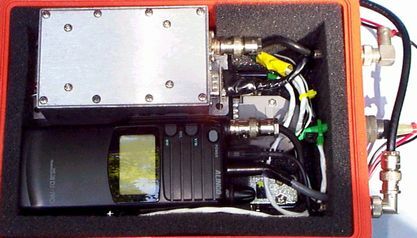 A Tracker is made as compact as possible so it can be easily installed in, or on most any vehicle. This is my APRS tracker. It consists of: Kantronics KPC 3 plus, Alinco DJ 190 2m HT, Garmin GPS-20 board (in box next to HT), Trimble external GPS antenna, Larsen 24/440 mag mount antenna, Radio Shack 30 watt amplifier, and a Pelican waterproof case.